January 12, 2019 Update: It’s interesting to look at this page knowing it’s nearly nine years old as I type this. While this page is still relevant there has been so many changes to the platform with many new manufacturers building rifles there is also no shortage of smart people designing tools for working on all AR platforms. This page will not receive any additional updates, however there is a new page devoted to AR 308, AR-10 and G2 .308 AR’s. Click the following link to visit the new AR-10 .308 AR Tools Page. Much like their smaller AR15 siblings these large bore 308 AR rifles require very specific tools. Additionally there’s more information at my other sites on basic gunsmithing tools and AR 15 tools. Handy tool aids in applying straight-line torque for fast, easy installation of the barrel nut without scratching the exterior of the upper receiver. Helps ensure the right amount of torque is evenly applied, while maintaining proper alignment of the barrel, upper receiver, and gas tube ports. 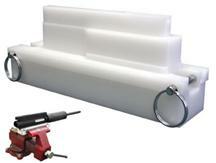 Use with any barrel nut wrench or free-float tube wrench and a torque wrench with a ½” square drive. Simply clamp the barrel nut wrench handle firmly in a bench vise, insert the barrel into the upper receiver, and finger tighten the barrel nut. Slide the barrel through the wrench, insert the Torque Tool in the back of the receiver until the teeth lock into the locking lugs in the barrel extension, and apply torque with the torque drive through the Tool to tighten the barrel nut. Precision machined from heavy-duty steel bar stock for years of reliable service. Available for the 308 AR. The “Receiver Claw” is the perfect armorer tool for holding all DPMS .308 upper receivers. Made of a solid one piece high strength polymer, the Claw is extremely durable. Simply clamp the Claw into a bench vise, slide the upper onto the Claw, secure with the two holding pins and begin installing your barrel and components. The DPMS “308 AR Lower Receiver Vise Block” is similar to an AR15 vise block. The plastic block is inserted and locked into the magwell like a magazine. The block is then firmly clamped in a vise. This is a must have item for working on lower receivers. 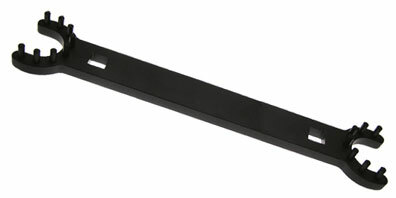 This DPMS 308 AR Barrel Nut Wrench will work with many AR-10,LR-308 and SR-25 free float handguards. 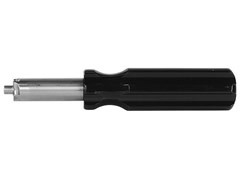 Heavy-duty PRI AR10 Barrel Nut Wrench provides plenty of leverage for installing and removing barrel nuts when used with a 3/8″ or ½” drive breaker bar, socket wrench, or torque wrench. Cut from 3/8″ thick steel, with plenty of metal so it won’t flex under pressure while transferring the torque evenly to the nut. Models available for AR-15/M16 and ArmaLite® AR-10®. 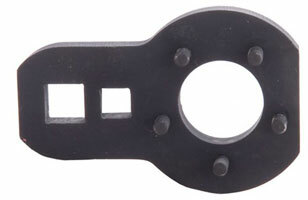 PRI Barrel Nut Wrench DPMS LR-308 (03-0086 ) – Same as the above except for the DPMS LR-308 barrel nut as well as many others. 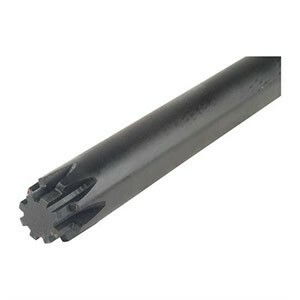 The 308 AR carbon scraper Used for cleaning out the bolt recess. Not exactly 308 specific but this simple tool allows you to easily align the barrel nut gas tube hole and receiver gas tube hole while tightening the barrel nut. It’s a hardened steel pin precisely ground to the diameter of the gas tube hole and either the notches or holes in a barrel nut.